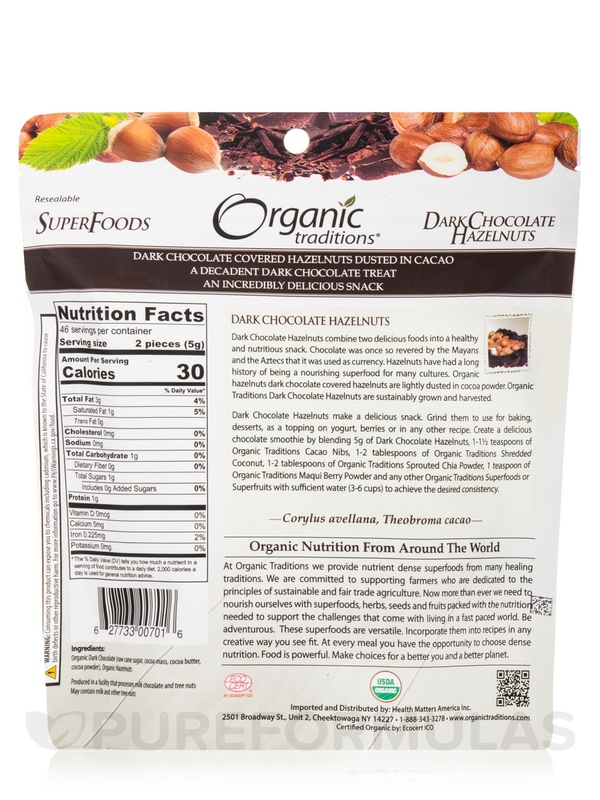 I love Dark Chocolate Hazelnuts by Organic Traditions and NO guilt! Dark Chocolate Hazelnuts by Organic Traditions is an excellent snack ymmm! The Dark Chocolate Hazelnuts by Organic Traditions are very tasty! Excellent snack! Organic Traditions Dark Chocolate Covered Hazelnuts combine two delicious foods into a healthy and nutritious snack. Chocolate was once so revered by the Mayans and the Aztecs that it was used as currency. Hazelnuts have had a long history of being a nourishing superfood for many cultures. Certified Organic dark chocolate covered hazelnuts are lightly dusted in cocoa powder to create the most delicious dark chocolate treat you have ever tried. Organic Traditions hazelnuts are non-pasteurized‚ sustainably grown and harvested and are Fair Trade certified. These gluten-free Dark Chocolate Hazelnuts are the perfect healthy decadent treat. *The % Daily Value (DV) tells you how much a nutrient in a serving of food contributes to a daily diet. 2‚000 calories a day is used for general nutrition advice. Ingredients: Organic Dark Chocolate (raw cane sugar‚ cocoa mass‚ cocoa butter‚ cocoa powder)‚ Organic Hazelnuts. Produced in a facility that processes milk chocolate and tree nuts. May contain milk and other tree nuts. Delicious on their own. Add them to your trail mix for extra sweetness. Organic Traditions Dark Chocolate Covered Hazelnuts are the freshest chocolate covered nuts I've purchased. It is dark chocolate heaven! They are dusted with cacao and the chocolate is pure and rich. No plastic taste like some chocolates. The nut is crunchy, not soft. I really liked these Dark Chocolate Hazelnuts by Organic Traditions. Ate 5 at a time (serving size is 10), a good delicious and healthy snack. You can't get enough of Dark Chocolate Hazelnuts by Organic Traditions - such a treat! Dark Chocolate Hazelnuts by Organic Traditions is my new diet 'trick'. I put one of these fantastic goodies in my mouth and 'play with it there' for a very long time. Keeps me out of the cookie box! I just love them! Everything. Dark Chocolate is the best of life. Dark Chocolate Hazelnuts by Organic Traditions is very delicious! Good benefits of dark chocolate and hazelnuts. A beautiful snack. Dark Chocolate Hazelnuts by Organic Traditions perfect blend of chocolate and hazelnut. 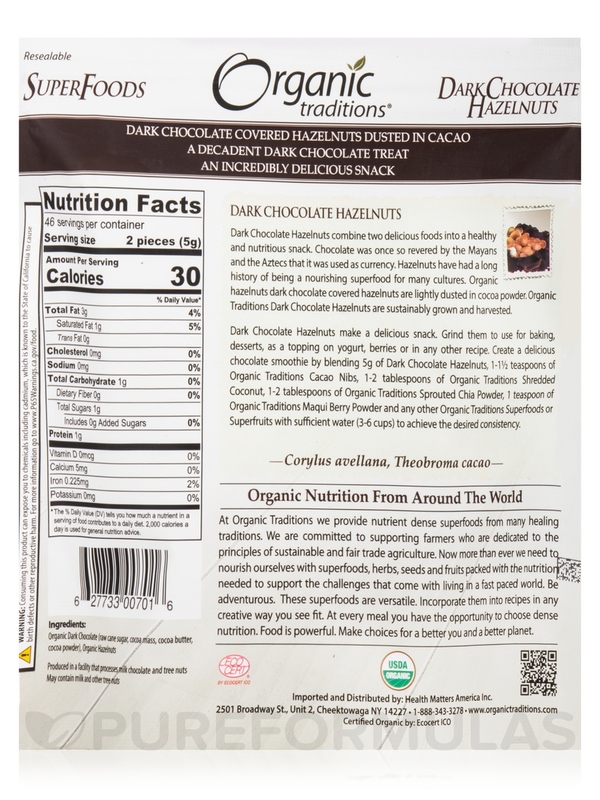 Dark Chocolate Hazelnuts by Organic Traditions is my "to-to" special snack. There is enough chocolate flavor to satisfy my desire for a sweet, but with the goodness of the hazelnut included! It has no ingredients that I can't eat! Flavor is wonderful. Pricey; but less on this site than in my local store. Dark Chocolate Hazelnuts by Organic Traditions melt in your mouth! Best in winter for shipping. So hard to find Organic Dark Chocolate Hazelnuts by Organic Traditions in stores. PureFormulas is the only place I can find them. delish! 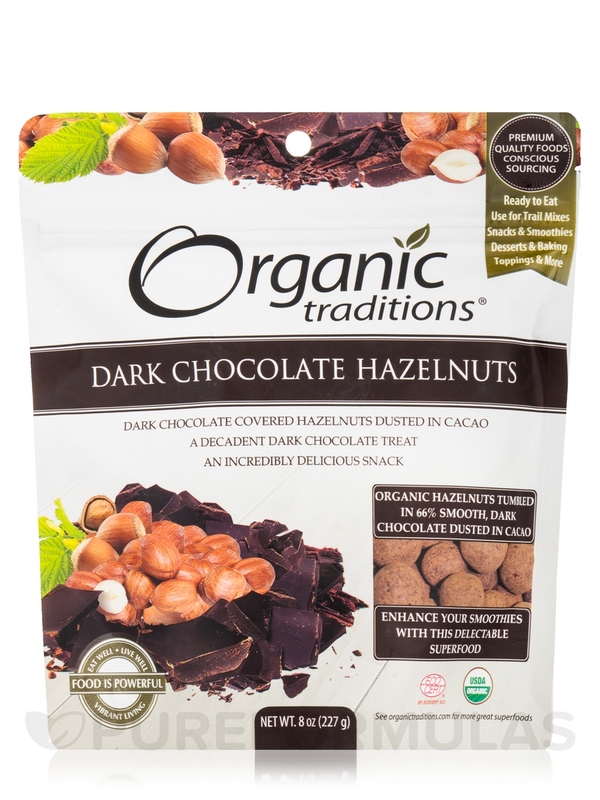 So hard to find Dark Chocolate Hazelnuts by Organic Traditions in stores. PuerFormulas is the only place I can find them. Delicious!